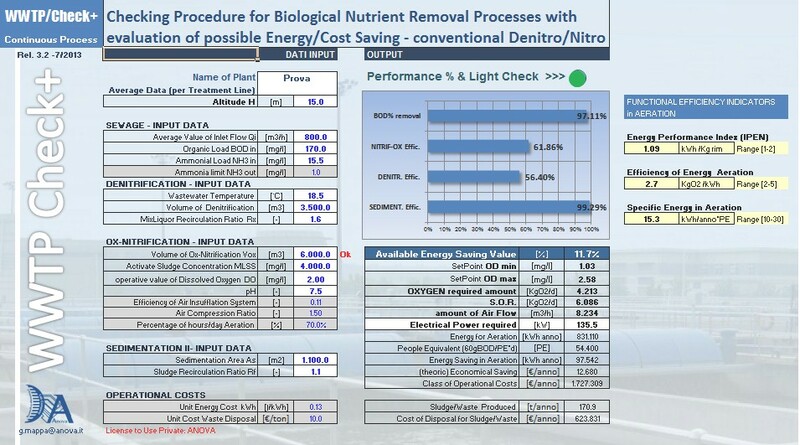 Percentage of Performance of Biological Nutrient Removal Process. Min/Max values of Dissolved Oxygen required to avoid process problems (bulking, etc.). Characterization of Functional Parameters of the Aeration System. Percentage of possible Energy Saving in the Aeration System (variable DO setpoint calculation on the base of min/max biological need…). Energy required for Aeration System. Percentage of Electrical Energy Cost Saving. Percentage of Sludge/Waste produced and their Cost. The WWTP/check procedure is available in MS-Excel file (.xls or .xlsx – MS Office-Excel 2007 or compatibles) to be better used as a checking tool and test. This entry was posted in InfoSolutions, WATER INDUSTRY InfoSolutions and tagged Efficient energy use, Environment, Microsoft Excel, MS-Excel, Operating cost, Oxygen saturation, Sewage treatment, Sludge, Wastewater, Watt. Bookmark the permalink.